Create a fun and unique atmosphere with this two tiered cocktail table. Multiple levels adds a fun dimension to your room while a glass inlay in the upper table brings a modern feel. A rich espresso finish completes the look of this piece. The Alice Cocktail Table by Steve Silver at Walker's Furniture in the Spokane, Kennewick, Tri-Cities, Wenatchee, Coeur D’Alene, Yakima, Walla Walla, Umatilla, Moses Lake area. Product availability may vary. Contact us for the most current availability on this product. Case Construction Constructed with Hardwood Solids and Ash Veneers. The Alice collection creates a fun and unique atmosphere with multiple table options. Varying height tables as well as tables with multiple levels provide added versatility for your living space. 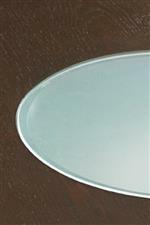 Glass inlays are found throughout and each piece has a beautiful rich espresso finish. These elements come together to create a distinct and modern feel. The Alice collection is a great option if you are looking for Contemporary furniture in the Spokane, Kennewick, Tri-Cities, Wenatchee, Coeur D’Alene, Yakima, Walla Walla, Umatilla, Moses Lake area. Browse other items in the Alice collection from Walker's Furniture in the Spokane, Kennewick, Tri-Cities, Wenatchee, Coeur D’Alene, Yakima, Walla Walla, Umatilla, Moses Lake area.